It seems that the Japanese are really exploring the idea of leaning multi-wheel concepts. First was the Yamaha Teseract, with its four wheels of leaning fury, which gave rise to the production of the Yamaha Tricity scooter, and the Yamaha 03GEN-f & Yamaha 03GEN-x concepts. Team Green has explored this space with the Kawasaki J Concept, Piaggio has its MP3 500 maxi-scooter (and supposedly has the lockdown on patents for this innovative design), and now Honda has its Neowing – a gas/electric hybrid leaning three-wheeler. Like its counterparts, this trike has two wheels in the front, with the rider in a motorcycle-styled sitting position. Adding to the motorcycle experience, the trike leans through turns. Huzah! The most intriguing part of the concept though, and perhaps the whole purpose to the exercise, is the hybrid power plant, which uses a four-cylinder boxer engine, along with an electric motor. It’s not clear if the electric motors power the rear wheel, or the front wheels, though we imagine Honda would tout the all-wheel-drive setup if it was the latter. With hybrid drivetrains surely to come to the two-wheeled space, it will be interesting to see if this is Honda telegraphing that fact – it is called the Neowing, or “New Wing” (what’s Honda motorcycle’s logo, again?). NEOWING is an unprecedented three-wheeled vehicle that offers the cornering feel and sporty ride of a large-sized motorcycle while realizing excellent stability at low speeds. This vehicle is equipped with a hybrid system that combines a horizontally-opposed 4-cylinder engine and electric motors to generate plentiful torque for powerful acceleration. 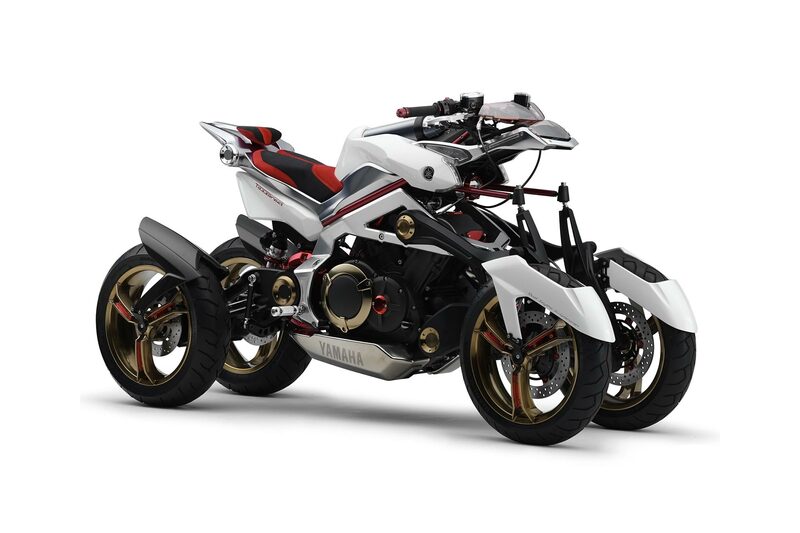 With the adoption of an original Honda linkage mechanism on its front wheel, this concept model proposes new values with advanced styling that emphasizes the mechanical fascination of a two-wheeled motorcycle model. It’s hard to say how serious Honda is about the Neowing as a production model. The concept looks appealing and in production form, though the design is definitely something more edgy than what we would expect from Big Red. The Japanese OEMs certainly do seem to have a fascination with the leaning trike form, likely looking for another appealing way to ply money from the hand’s of thrill-seeking consumers. Is it a motorcycle? Many will say no. But like the Polaris Slingshot, it represents another fun way to rip around on the streets, which will likely appeal more to non-motorcyclists than our current crop of readers.